A fresh batch of pan-grilled tomatoes. Fresh tomatoes have a natural sweetness that make them a perfect candidate for the grill. As the tomatoes sizzle on the grill, the sugars caramelize, resulting in a taste that's sinfully sweet and slightly smokey. Grilled tomatoes are an impressive and flavorful side dish that shouldn't be restricted to the summer grilling season. If you don't have access to an outdoor grill, or don't want to fire up your grill in inclement weather, a grill pan allows you to get the same results from your stove. Preheat the grill pan over medium-high heat for five to seven minutes. Cut the tomatoes in half lengthwise using a sharp knife. Brush both sides of the tomato halves with extra virgin olive oil. Season the tomatoes with salt and pepper to taste. Add additional herbs and spices if desired; garlic powder, onion powder, sage and rosemary are flavorful choices. Place the tomatoes, cut side down, on the heated grill pan. Grill for four to six minutes per side, turning the tomatoes 45 degrees halfway through the cooking time to ensure attractive crosshatch grill marks. 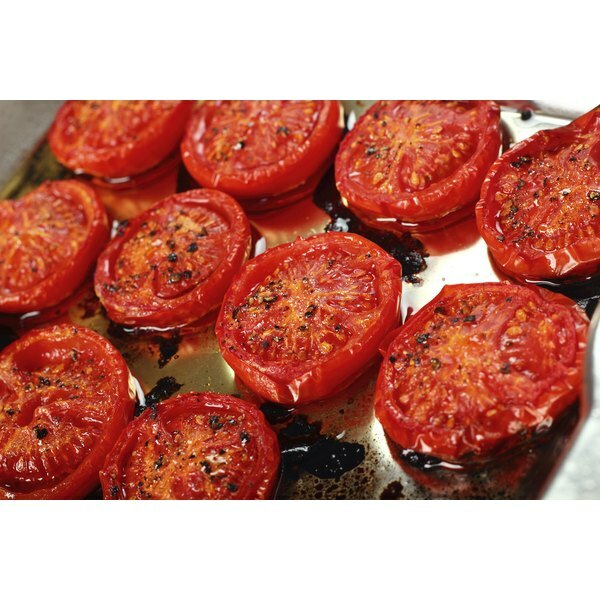 Brush the ridges of the grill pan with extra virgin olive oil to prevent the tomatoes from sticking, if necessary. Allow the grill pan to cool thoroughly before washing it. Grilling; Denis Kelly, et al.